Lead in backyard eggs: Should we care? (1) Is this worth being concerned about, or is it scaremongering? (2) If you're concerned, what should you do? (3) If your land has lead in it, can you still keep chickens and eat their eggs? Is Stuff full of stupid stuff? A couple of FB-followers commented that they don't believe what they read on Stuff. In this case, at least, Stuff's report is valid: it's an accurate report of a paper that was published in December 2018 in the New Zealand Veterinary Journal. A summary of that study is here. It looks like a well-conducted, rigorous study. Is lead anything to worry about? One FB follower commented that they'd rather have backyard eggs with lead than eggs with antibiotics from stressed hens. I get that - I am a lover of things natural and homegrown. Our family's food comes as much as possible from our garden and the Farmer's Market. But if I had to choose, give me antibiotics over secretive, damaging lead any day. Our bodies need certain metals for good health - zinc and iron, for example - but lead is not a natural part of the human diet. It is an odourless, tasteless neurotoxin for which zero is the only safe level. It is never expelled from our bodies but simply accumulates. It does not biodegrade. There is an overwhelming amount of evidence that it damages brains and lowers intelligence. Just last week a new study was released showing an association between high blood levels at age 11 and psychopathology in adulthood. The results came from nearly 600 people who were children in Dunedin in the 1970s. There's information here from the World Health Organisation on the problem. But lead is a fact of modern life, and below a certain level of it in our bodies (which is not zero), we seem to be okay. We cannot completely escape the lead that our predecessors put into our environment, not realising that it was harmful, so we'll all have some inside us. We just need to minimize it. If we have babies and children, it's worth being more paranoid: they tend to ingest more of it and their developing brains are more vulnerable. The effects are thought to be irreversible. So, in my opinion, if you're a parent of little ones, it's not really your "personal choice" whether you care about lead. Our family's earliest days of chicken-keeping. The NZ Vet Journal study showed that all the eggs in their study contained lead. Over half of them had a higher-than-safe level of lead. They also took blood samples from the chickens which, as you can imagine, had similar levels of lead as were found in their eggs. It's worth noting that this study was conducted in backyard eggs from central Auckland, which is an area with plenty of old weatherboard houses that were likely to have been painted with lead paint. But there are plenty of those all over the country. We've all seen our chickens gobble cockroaches and worms covered in dirt. Yum. But chickens get lead from the soil in which they forage, and from the invertebrates they eat that live in that soil. Chickens eat dirty stuff - much dirtier than this. Sometimes there is lead in that soil, resting there from historical contamination. There is no way to detect it without lab tests, but there are some clues that lead might be there. Before we hand over money to lead-testers, I wanted to find out how each of us can figure out if we might have lead on our land. I spoke to Dave Bull, a director of Hail Environmental. As we spoke, I realized that if there is anything about lead worth knowing, this guy knows it. And until he had to move house recently, he was a chicken keeper! Perfect. So, what did I learn? NZ houses used to be painted with lead paint, and in some cases that persisted until the 1980s. Little ol' NZ was pretty slow to the international lead paint-banning party that was held to celebrate the realization of how toxic the stuff is. Dave reckons that if your house is not brick-clad and was built before 1950, it's very likely to have been painted with lead paint, and in the interim someone has probably sanded it and repainted. The sanding dust sunk into the soil and its lead will still be there. I adore old houses. Except for the lead. Most of it will probably be within two metres of your house - or your garage, if you have one of that era, as that was probably also painted with lead paint. If your chickens are many metres away from your house and garage along your back fence boundary, there is probably less lead there. Resene does free tests for lead paint - you can just take in a flake or board and give it to them. They can only tell what's on it now, of course. Obviously we have unleaded petrol these days, and by now you know what motivated the 1987 change to unleaded petrol. Exhaust emissions used to contain lead. If you live on a road that was a busy traffic road before the 1990s, your front yard probably has lead in it. Happily, that lead doesn't spread far, so although it would be a bad idea to keep chooks at the front of your house, the backyard is likely to be unaffected. Dave says that the land within eight metres of the road is the bit to avoid. I hate the passion-vine hoppers sucking the life out of our citrus and beans! Insect pests have been a problem for a long time, and many of our parents, grandparents and great-grandparents sprayed them, especially if they were growing crops for a living. A commonly-used spray was lead arsenate. Apparently it was brilliant at controlling all sorts of insects: grass grub, codling moth in apples, and aphids on roses. But it left lead (and arsenic) in the soil. The ever-present annoyance of insect pests. It's impossible to know how people gardened on your property in the past, which is a worry. But if your land used to be orchard land or market gardens - and several towns in New Zealand have expanded their housing over old horticultural land - it might be worth testing for lead. There are some industrial land uses that have left a legacy of high lead levels in soil. There was once a battery factory in Onehunga, for example, that has left behind lead to within 100 to 300 metres of its site. But what about lead in commercial eggs? Commercial eggs have been tested for lead, and the lead was below detectable levels, which is much more desirable than the studied Auckland backyard eggs. This result is from a 2016 Ministry of Primary Industries "New Zealand Total Diet Study" (see page 173 - I'm guessing these are battery cage eggs, not free range). How do I find out if our eggs have lead? 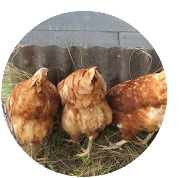 Firstly, unless your chickens have very high lead levels, they may still appear healthy - but the levels can still be worryingly high. If you have an old house, or keep your chickens close to a busy road, or live on old horticultural land, or have young children, it might be worth having some testing done. 2. Send an egg or eggs to Hill Laboratories in Hamilton (confession: my husband works there, although not in the food section! But this recommendation comes from the study author. I am not even sure there's another commercial lab in the country that can do it). At Hill Labs, the cost is $66+GST per analysis. You can ask for that to be an analysis of one egg, or you can ask them to mix together the content of several eggs (three would provide a good average) and do one analysis on that combination. You can also ask for each egg to be analysed individually, in which case each egg will cost you the $66+GST. Just be very clear in your instructions, they tell me! Package the eggs very carefully so they won't break when you send them. To encourage the courier to treat eggs as fragile, write FRAGILE! EGGS! on the package. You'll need to accompany your eggs with a filled-out version of this form. Contact them with any questions. "There is no maximum permissible level for lead in eggs in New Zealand ... the Ministry for Primary Industries advises that lead concentrations in eggs should be ‘as low as reasonably achievable’. In the edible portion of eggs, this is a target of 0.002 mg/kg or less, based on the 2009 New Zealand Total Diet Study ... ". In the NZ Vet Journal study, all the eggs had more lead than that! Instead, they treated the maximum level as 0.1 mg/kg, which is the maximum permissible level for lead in meat, according to the Ministry for Primary Industries. What if our eggs do have a high level of lead? This is the toughest question to answer. I'd be talking to the people at Hill Labs about having soil testing done. Contaminants such as lead tend to be patchily distributed, and there may be low-lead parts of your property that are better suited for chicken-keeping. At that point you would probably need to get new chickens, because lead will have built up in the old ones (although see the comments from Lena, below). - provide uncontaminated soil, ash or sand for them to dust-bathe in. Dave Bull of Hail Environmental is a consultant who can help you figure out anything you want to know about contamination with lead or other substances, including just how worried you should be. He tells me he spends quite a lot of time telling people that the problem isn't as bad as they think. "The problem then was that I could treat them - you can inject a solution that binds lead and encourages them to excrete it from their bodies - but as soon as you got their levels down - which you can do in some cases if their load's not too high - they would reingest lead from our contaminated soil. I loved those little lasses (they were ex-battery so they'd had a tough life already) so I went as far as researching how to remediate soil. I put down matting in an area that covered their coop and run and got fresh topsoil (one garden supplies shop was able to supply guaranteed clean topsoil from a farm in the Far North). My plan was to try and rehome them but one died from egg peritonitis some months later and the second's levels kept going up (possibly from eating worms or other dirt-dwellers around the coop area). "And then the saddest part - they excrete the lead, so their pee and poo recontaminates, or contaminates other areas." You can read the rest of her helpful comments underneath the original Facebook page post. Thank you to all the experts who helped me gather this information: Professor Brett Gartrell (Massey University), Graham Corban (Hill Laboratories), Dave Bull (Hail Environmental) and Cecilia van Velsen (Cambridge Vets). Help, my chickens are fading! Actually, ignore the first part of that title - I don't need help. But my chickens are definitely fading. This is a normal part of ageing for brown shavers and Hy-Line Browns. They become less brown and more blonde as they grow older. This beautiful friend of mine, for example, was quite cocoa. Then she lost a lot of her feathers in a thorough moulting session over a few weeks, and when they grew back she'd turned into caramel! The other two haven't moulted as comprehensively, but you can easily tell which feathers are the new ones. They are a now a camouflage-like combination of chocolate and caramel (yum!). Their legs fade, too, becoming fairer and fairer with the years. It's easy to assume that when one hen pecks another, it's an aggressive act. "Ah, the pecking order," you might think, and feel sorry for the victim. And sometimes it is like that, but often not. And the good news is that by setting up your chicken-keeping arrangement well, you can prevent at least one type of pecking happening. Recently I witnessed something I've never seen in my birds. One hen stood over the other, delicately plucking out the feathers from either side of and behind her comb. The 'victim', who looked slightly uncomfortable, stood and allowed it to happen. You can see it in this video. There was no aggression. The pecking was so gentle that the victim's skin was clear and unmarked. She was unattractively bald, but there wasn't a patch of blood or even pink skin. What's more, these two birds are pals. They hang out together, and dominate their flockmate quite aggressively. The pecker reminded me of an overly thorough cleaner who just couldn't bear to leave behind a speck of dust. When I was studying for my PhD with chickens, I saw something far nastier. Again, the pecks were not aggressive, and the victim did not dodge the blows. The pecks were directed not at the victim's head, but at the base of her back, above her tail. However, the 'cleaners' were not gentle, and the victim's back was bleeding. When this happens, the instinctive blood lust of chickens takes over. They are omnivores, after all! They tend to hone in on the victim and ramp up their pecking (mmmm - flesh! ), and it gets very ugly. It turns into cannibalism. If this happens, the victim will have to be removed until she heals, or even put out of her misery. Giving hens access to litter to peck and scratch at is vital for preventing this type of bad behaviour. In fact, it's not bad behaviour that's the problem, but a bad environment. Chickens naturally spend the majority of their day pecking and scratching at loose litter under their feet. This is not optional depending on whether they are hungry or not, although it is a food-seeking behaviour. It's just what they must do, in the same way that a cat must sleep a lot, lick its fur and seek warm places to sleep in winter and cool places in summer. It is their nature. But I had done my birds a disservice. I'd gone away for five weeks during a wet winter, and my husband had no inclination or time to care for their run the way I would have. Let's just say that keeping food in their hopper was challenge enough. The ground was bare and muddy. The autumn leaves I usually collect and spread in their run in winter had gone into the neighbours' green bins (horror). A bare ground is abhorrent to chickens, especially if it's wet, and they turn to a readily available source of something that seems a bit litter-like: their flockmates' feathers. You can hear more about this here, in a short educational video from the University of Edinburgh. You can't see the whole thing unless you enrol in the course, but what you can watch is useful. I only noticed the obsessive little behaviour happening in my backyard because the victim became sick (this was the foxglove poisoning episode - in fact you can even see the gnawed foxglove plant in the background of the video above!). That fact alone shows that I wasn't caring for my birds very well, otherwise I would already have noticed the bald head. I separated the sick bird, but I expected that when she was returned she would again be plucked. I did indeed see one more plucking episode. But then, strangely, her feathers began to grow back! Now she has a new crop of feathers, and no further problems. The new feathers are a little bit crimped. The new feathers are also slightly more ginger. I like redheads. These pin-like feathers beside her comb are fortunately no longer proving irresistible to the pecker. Once this type of obsessive pecking begins, it can become an entrenched habit. It can even be copied by other birds. So always give them something to peck at that is not each other! If you see feather pecking happening, top up their run with weeds, leaves, compost, fresh soil - whatever you can get your hands on. Separate the victim if necessary (and definitely if there is any blood). You can cover the area being attacked with a repugnant solution known as coal tar. This is an old-fashioned remedy for humans, and used on irritated skin in conditions such as psoriasis. It smells really, really strong, and I can hardly imagine how it must taste. If you have some in your medicine cabinet or can find a strong version at a pharmacy, you could spread it on the victim's skin. In spite of its smell, it is a healing thing, so it won't hurt the bird, and it should repulse the pecker. You can buy a poultry-specific version here. Aggressive attacks happen. They are how hens establish and maintain the social order, and in those cases you'll see that the peck is fast, hard and aggressive, and the victim cowers and moves away, often with a cry of what sounds like fear. This happens a lot when you first mix new birds together. Often if you keep the birds together from a young age, with no newcomers, there is no obvious hierarchy or aggression. Sometimes there is, though. Once everyone knows their place, the attacks become rare. Plenty of space to escape. More than one source of food and water, spread apart, so the bullies can't dominate these resources. A situation where the new birds outnumber the existing ones. Age parity - birds that haven't started laying (because they are pre-pubertal) are less able to defend themselves than sexually mature birds. Time - it will probably take at least two weeks for things to settle. No matter what you do, it's a very unpleasant situation, and I try to avoid it. An all-in, all-out situation is ideal when you change flocks. That way no newcomers have to run the gauntlet of existing birds that bully them aggressively. To figure out what kind of pecking problem you have, ask yourself firstly whether the victim seems to mind. If she stands there and takes it, it's feather pecking, not aggression, and you probably have a litter problem. Sort that out first. In fact, sort that out right now so that the problem never occurs. I firmly believe that the most important knowledge for chicken keepers is not what this sickness or that sickness is, but how to avoid problems in the first place. Give your birds litter, as much space as you can, a private nesting spot and a perch to sleep on. Those fundamentals will go a long way to stop you having to look up what's wrong with them, because they will be healthy and lovely! Sometimes as I beat eggs I imagine an alien watching the process. Wouldn't he/she/it be amazed that a simple egg can be transformed into something so unrecognisable and delicious - and into such a range of dishes? It's something we take for granted, but I love to look at things as if I came from outside our culture in order to get rushes of pleasure from the many wonderful things we see as ordinary, just because we see them all the time. One of those things is the ability, even on small urban sections, to keep feathery livestock and grow our own fruit and vegetables. The part of me that is still a little girl sees that as a fairy tale opportunity, and longs to do that when she grows up. The part of me that is turning 45 this year hears that child, and gets out there to tend the chickens and plant the seeds to make sure I make the most of the opportunity afforded to me, even when there a million other things to do in this busy life. Some things I just will not compromise on! I'm also unable to compromise on good food. I am a thorough food lover and cook, and this works well with a bit of urban homesteading. Yes, I may be eating plums for the 20th day in a row, but they are only ripe on the tree for a few weeks, taste far better than anything you can buy in the shops, and I'm going to damn well make the most of them! Last weekend I made a large pavlova (with our own eggs) for a neighbourhood barbeque, and topped it with our own sliced deeply red and flavoursome Hawera plums. I forgot to photograph it, but the top photo of this post shows a little extra one I made for my family at the same time, so we could enjoy it the next day. It's decorated with our homegrown blueberries. I'm a bit of a pavlova queen, and use Nigella Lawson's recipe in How To Eat. I'm sorry I can't share a link to it; it's not one of her online recipes. I'm sure your local library will have the book. She has more elaborately flavoured pavlova recipes on her website, https://www.nigella.com/, but I haven't tried them. Christmas pavlova last year, under my instruction. It was one of my favourite parts of Christmas! My top pavlova tips are to beat in the sugar thoroughly, just a tablespoon or so at a time, and to use somewhat aged eggs. You want them to be at least a week old - not a problem for supermarket egg buyers, obviously, but a matter of management for chicken keepers. Another thing to think about from a fresh perspective: how about those electric beaters, eh? Aren't we lucky? Our grandmothers used egg-beaters, the muscle-powered kind! I once made a pav like that, with a couple of other women taking turns beating, because the electric beater was nowhere to be found. All agreed that it was the best pavlova we'd ever had. My next use-up-eggs recipe is to be the Buckwheat and Cherry Cake recipe here. It comes from the January 2017 New Zealand House and Garden magazine. It's basically a classic sponge cake with buckwheat flour instead of cornflour and plain flour - a bit Black Forest Gateaux-ish. I'll use our homegrown berries instead of cherries. The omelet - something so hard to spell correctly, I find, but so quick to make to use your backyard protein source. I pack my omelets with vegetables, herbs and cheese for a great lunch. Mine aren't overly photogenic, but after just reading this article on bite.co.nz, I think they're about to get better. I hope you find it inspiring, too. So, from my tastebuds and stomach, I say each day as I collect eggs from the nest box: Thank you, ladies. I wish you much happy, healthy eating with your own eggs and produce! Earlier this month I got this question from a follower: "One of the chooks keeps heading back to the coop to sit in the nesting box, sometimes, not always, sitting on an egg. She is all puffed up & filling the whole nesting box. When I give them their mash in the evening, she's not as interested as she used to be. She looks much fatter (or fluffed up?) than the other 2. What's going on? Does anyone know?" This is a fantastic description of a broody hen: fluffed up and refusing to leave the nest box. She might also have a paler comb and, when she does go out for a quick snack and a drink, make a quiet, clucky sound, which is why another word for the condition is 'clucky'. To me, broodiness is like a kind of craziness has grasped the bird. She can think about nothing other than sitting on her eggs, keeping them warm. Whether they are actually fertile is neither here nor there to her. In fact, although eggs make her more likely to stay on the nest, she'll sit in there even after you've taken them away. By the time she's noticeably broody she'll have paused her own egg-laying and will be tucking the other hens' eggs under her warm belly, which has probably become fairly bald to allow skin-to-shell contact. Competition for space in the nest box. It takes three weeks of incubation for chicken eggs to hatch, so your broody hen is likely to be in this state for a long time if you don't do anything about it. Without the stimulus of chicks appearing out of the eggs she may stay broody even longer. She'll get very thin, as incubating hens rarely eat. If you want chicks, of course, broodiness is wonderful. You can buy fertile eggs cheaply off Trade Me, pop them under your hen, and in three weeks they'll probably hatch. A broody hen needs a quiet nest box to herself, and a safe place for her and her chicks (i.e. where cats, dogs and adult hens can't get to the chicks). They'll also need a water container that chicks can drink from but not drown in, and chick starter food. Having a mother hen and chicks is delightful. If you don't want chicks, broodiness is a downright nuisance, and requires attention. It will be ongoing, too, because a hen that's prone to going broody will keep doing so again and again, even if you let her have chicks. She's valuable to people who want chicks, though, so you can easily sell her. The most important thing is to keep her away from the nest. Some hens snap out of their broodiness more easily than others, and it may be a simple case of blocking off the nest box as soon as the other hens have laid, then unblocking it once darkness falls and all the birds are roosting. Once I had a huge Orpington who occasionally went broody. I blocked off the main nest box, which was slightly raised, and put straw underneath it, because the Orpington's brown shaver flockmates could get under there to lay, but she was too big to squeeze in. That way the broody bird was completely excluded from a nest box, but the others had a reasonable substitute available. After about three days the Orpington would come right - but she was a particularly easy fix. More persistent brooders will just sit somewhere else, even if it doesn't resemble a nest. My most persistent one, a blue Orpington, once just sat in mud as the rain fell on her. She was completely gripped. In this case, a broody cage is a good solution. This can be anything patched together as long as it has a roof that shades and shields, four walls (wire mesh is good) and a wire mesh floor, with plenty of food and water available. The idea is to get "air under her skirts". The hen needs to stay in there for, well, as long as it takes for her to stop seeming broody! This is a shorter time than it will take for her to lay again, so you needn't leave her in there that long, as it is a bit mean. Just look out for her standing rather than sitting, feathers sitting flat and normal sounds. If she goes to the nest box when you return her to her coop, she needs longer in the broody cage. Not having a broody cage, I recently came up with a different approach. I fenced off a paved area of our property well away from the coop, and put the broody in there, alone. She squawked terribly, and escaped repeatedly until I secured the fence properly. She was so distressed at being isolated in this way that she never sat down at all (this bird has a particularly reactive personality). At night I let her go back to her pals, and made sure she was on the perch at dusk. After three or so days of this treatment she snapped out of her broodiness. A couple of weeks later, there she was, back in the nest box all day. Intolerant as I am of broodies, and greedy for eggs, I abandoned the fight and gave her away to someone who celebrated her broodiness and let her have chicks. Sometimes modern hybrid breeds like brown shavers go broody, but it's rare. The heavy, beautiful breeds that I love so much are the worst offenders, as are the delightful little Silkies. However, even within a breed there will be unpredictable variation: some individuals just do go broody, and some just won't even if you want them to. Such is nature, teaching us yet again that we cannot control her! Goodbye, pretty hen. You were too broody.